Lawrence Apartments Hostel has 17 rooms that are ideal for travellers on a budget. It provides a swimming pool, a bar, a restaurant and ticket printout services. It also offers a 24-hour reception, a tour desk and luggage storage. Those staying at the property have access to a gym, and a barbecue area. Lawrence Apartments Hostel serves breakfast daily, and guests can relax with a drink in the bar. A wide variety of dining options are available. There are many events and activities that take place at the hostel daily. Most activities are free of charge and some are not. All events & activities are posted in detail at the event board. 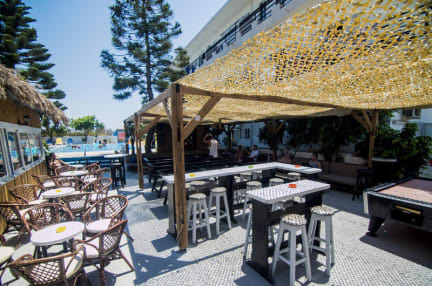 Lawrence Apartments Hostel is situated five minutes on bicycle out of Kos town centre and is close to the Island’s well-known attractions. Lambi or Lampi beach strides out of Kos Town, north of the harbour to the the northern tip of the island and around the headland. The deep Lambi sands run along the east and north facing shores and are packed with sunbeds for several kilometres. Lambi beach is a favourite with families with soft sand shelving gently into the sea, so it's safe for the youngsters. Just a stone's throw from nearby beaches, bars and clubs, this hostel also allows guests to explore the best of the local nightlife. We have the perfect accommodation. All rooms at the hostel feature with nice and comfortable bed, linen and lockers. We provide mixed dormitories with shared bathrooms. De kamers zijn schoon, de bedden prima, alle faciliteiten zijn oud en aardig versleten, maar het voldoet prima. Het ontbijt is in buffervermogen met genoeg keuze. Er zijn daar erg veel muggen, die agressief zijn, dus antimuggenspul móet. Ook waren er mieren in de kamer en daar zijn ik en een kamergenote ook flink door gebeten. Toilet en douche zijn op de kamer. Airco is er, maar daarvoor moet je bijbetalen, maar dat maakt het wel heel lekker. Er is ook een zwembad.